Barry Sanders was drafted by the Detroit Lions in 1989. In 1997, Sanders had his greatest season ever, when he rushed for a career-high 2,053 yards. In Sanders' career, he achieved Pro Bowl status in all of his 10 seasons as a pro. Sanders was named first team All-Pro eight times from 1989–1991 and 1993–1997 and was named second team All-Pro twice in 1992 and 1998. Sanders was also named All-NFC from 1989-1992 to 1994-1997. Sanders was named NFL Rookie of the Year in '89, Offensive Player of the Year in '94 and '97, NFL MVP in '97, and was named to the 1990s NFL All-Decade team. 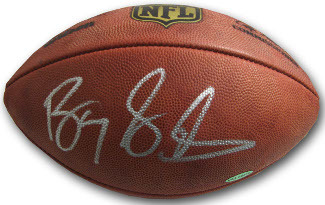 Barry Sanders has hand autographed this Official NFL New Duke Football. Upper Deck Hologram and Certificate of Authenticity. This Is The Most Popular Of All Of Our Deluxe Football Cases. The Base Is Black Acrylic With A Cutout To Hold The Ball In Place And Gold Risers. A Matching Nameplate Is Included With Your Order. This Wall Mount Display Case Holds a Full Size Football In The Horizontal Position. You May Choose Any NFL Team Logo Or The NFL League Logo To Be Engraved FREE On The Front. The Frame Is Available InThe Following Finishes; Wood, Mahogany, Or Black. Inside dimensions are: 12" Width, 8 1/4" Depth, 6 1/2" Height. Overall dimensions are: 17" Width, 8 3/4" Depth, 12 3/4" Height.